Revenue in the Sauces & Condiments (without ketchup) segment amounts to US$107,789m in 2019. The market is expected to grow annually by 3.4% (CAGR 2019-2023). In global comparison, most revenue is generated in United States (US$34,338m in 2019). In relation to total population figures, per person revenues of US$14.64 are generated in 2019. The segment covers mustard, mayonnaise, BBQ sauces and other emulsified sauces as well as preparations for making sauces such as gravy granules and bouillon cubes. Reading Support Revenue in the Sauces & Condiments (without ketchup) segment amounts to US$107,789m in 2019. Reading Support The Sauces & Condiments (without ketchup) segment is expected to show a revenue growth of 4.1% in 2020. Reading Support The average revenue per person in the market for Sauces & Condiments (without ketchup) amounts to US$14.64 in 2019. Reading Support In the market for Sauces & Condiments (without ketchup), volume is expected to amount to 31,885.5 mkg by 2023. 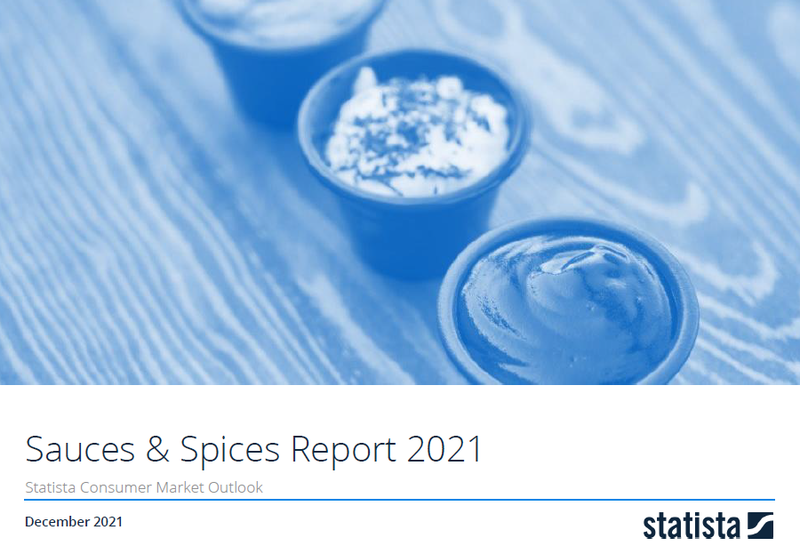 Reading Support The market for Sauces & Condiments (without ketchup) is expected to show a volume growth of 1.4% in 2020. Reading Support The average volume per person in the market for Sauces & Condiments (without ketchup) amounts to 4.1 kg in 2019. Reading Support The average price per unit in the market for Sauces & Condiments (without ketchup) amounts to US$3.57 in 2019. Reading Support With a market volume of US$34,338m in 2019, most revenue is generated in United States.